Edox is the official timekeeper of the FIA World Rally Championship (WRC), a series of multi-day motor-sport races that take place across 13 countries, in climates ranging from extreme cold to extreme heat, on surfaces both smooth and grueling. 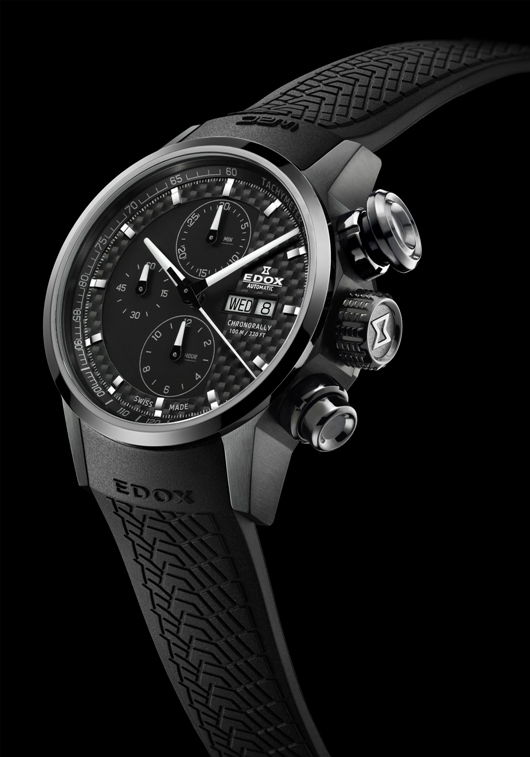 The men’s Chronorally Automatic Chronograph is the latest offering from Edox in this driving-inspired collection. 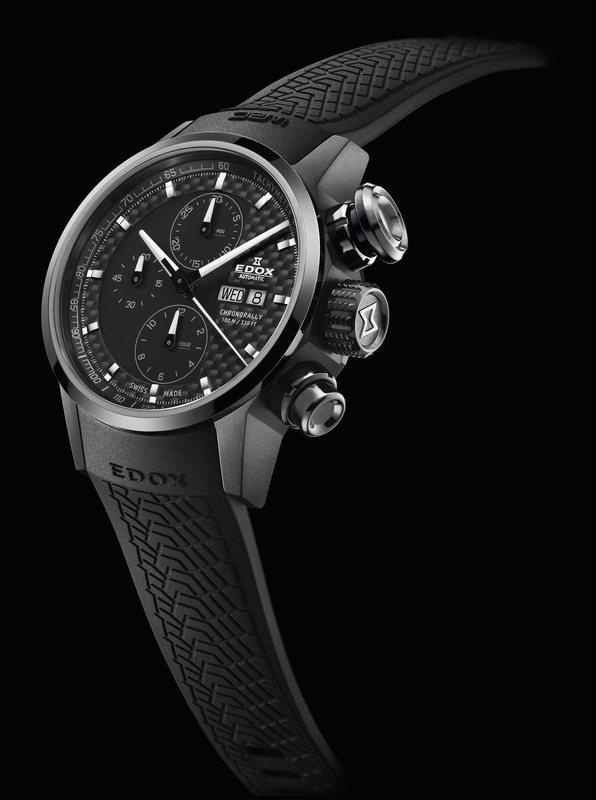 The Chronorally Automatic Chronograph is an official WRC timepiece that emphasizes Edox’s commitment to linking its designs to the events and activities it sponsors. The watch has all of the features generally associated with the collection such as the profiled rubber strap, the carbon fiber dial and signature oversized aluminum pusher, which is perfect for starting and stopping the chronograph function even in the roughest conditions. One significant difference between this Edox Chronorally, introduced earlier this month at Baselworld 2012, and previous iterations is that this is the first in the collection to feature a PVD coated case and buckle. 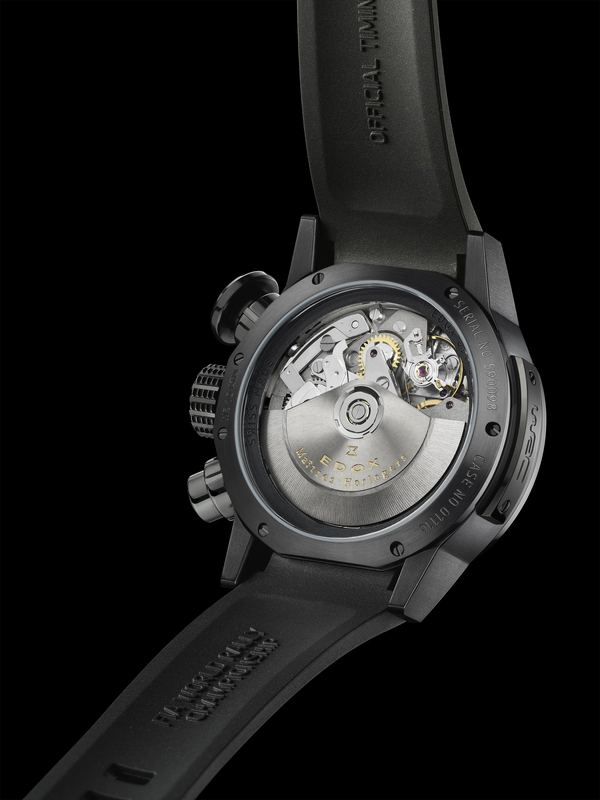 The combination of PVD, carbon fiber and rubber typifies the modern paradigm of a racing watch. When fused with the famous Valjoux 7750 automatic chronograph movement, the result is a motor-sports watch worthy of the WRC. But it wasn’t enough for the designers at Edox simply to fit the new Chronorally with an outstanding automatic engine – they wanted to show it off. The watch therefore boasts an unusually large caseback window, nearly 36 mm in diameter, perfect for admiring what’s under the hood. 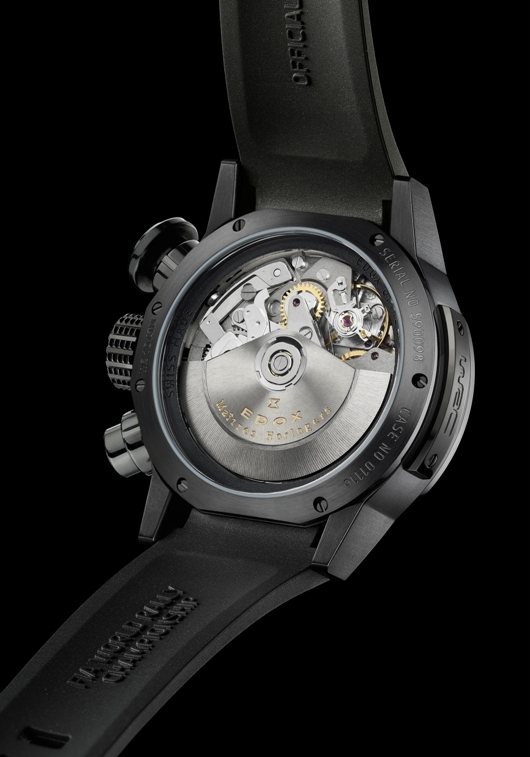 From the rear view, a matching movement ring is visible; on the black model, the dial, start-stop pusher and movement ring are all black. The watch comes in two other variations: a blue dial with matching blue start-stop pusher and blue movement ring, and a red dial with matching red start-stop pusher and red movement ring. The cases of the blue and red models are constructed of polished and brushed stainless steel without a PVD coating. The case of the new Chronorally Automatic Chronograph is 42 mm in diameter and water resistant to 330 feet ensuring versatility in both comfort and durability – a true partner for any activity. The new Edox Chronorally Automatic Chronograph will soon be made available through your authorized Edox dealer.